“Cabin crew resume your duties but please be careful!!”. The plane had been thrown around like a ragdoll for the past twenty minutes and the pilot was obviously concerned. I had even been amazed that our flight had taken off from Dubai as planned, Typhoon Phanfone was scheduled to hit Tokyo around the time we were due to land. 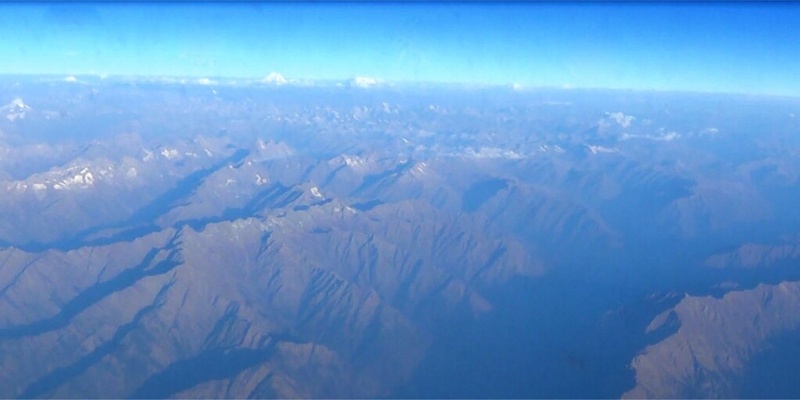 The Hindu Kush through Emirates grubby windows…just before the blinds were snapped shut!! The flight from Dubai had been weird. We left DXB around 3am although I had planned it that way as I wanted to watch the sunrise above the Hindu Kush where we would be flying over. What was weird was the way the cabin crew treated us. As the sun rose a steward had demanded that all of the blinds be shut. I, for one, would not close the blinds, I wanted to see the peaks of the Hindu Kush, one of the most famous mountain ranges in the world. Another passenger started arguing with the steward and refused to close the blinds, other people came to the passengers defence. I can now see why cabin crew act like this, it’s not to help passengers sleep (they all have free eyemasks handed out with the Emirates night kit), it is just to make the plane seem dark so that passengers will sleep and in doing so give the cabin crew less work. For me it would be the last time I would ever book a flight with Emirates. Once we were allowed to open the blinds we were above northern China, the landscape seemed a scarred rust yellow. Last time I had flown over China it was the southern regions on my way to Hong Kong (and ironically also into the path of a typhoon) and all I can remember were endless green mountains. Just before reaching Japan we had an amazing view over Seoul and parts of North Korea. It was when we reached the islands of Japan that things changed, we could see nothing with low visibility and white fog, it would remain like this until a few seconds before landing when runway lights appeared. My first impressions of Japan at Narita airport: dark and depressing, super polite airport staff. Narita was also a surprise, the arrivals area where we were funnelled through to passport control and customs seemed very basic and dated, I had imagined a sleek Tokyo, especially at Narita! We took the Narita Express train to Shinjuku, translated as New Town, an area that had become the new center of Tokyo after WWII leaving Ginza in it’s shadow. After the tsunami of 2011 the Japanese government has been trying to attract foreign visitors, we felt the benefits straight away, flash your foreign passport and you get the N’Ex (Narita Express Train) into town for half price. It was on the N’Ex that I noticed the futuristic Japan, on an electronic LED display in the carriage was a timeline of our journey and was showing our exact point plus connecting lines. A woman came through the carriage with a cart selling snacks, I was amazed at her voice which my boyfriend and I nicknamed “baby voice”. Baby Voice was to follow us all over Japan. By the time we got to Shinjuku Station the streets were literally flooding with the torrential rain. We walked through the train station and got a taxi to our hotel. I read so many times about the maze that is Shinjuku Station, the world’s busiest travel point, and how many a traveller had gone into it’s labyrinth never to be seen again. Nowadays with Google Maps I just followed the yellow signs to the East Exit, no big deal really. 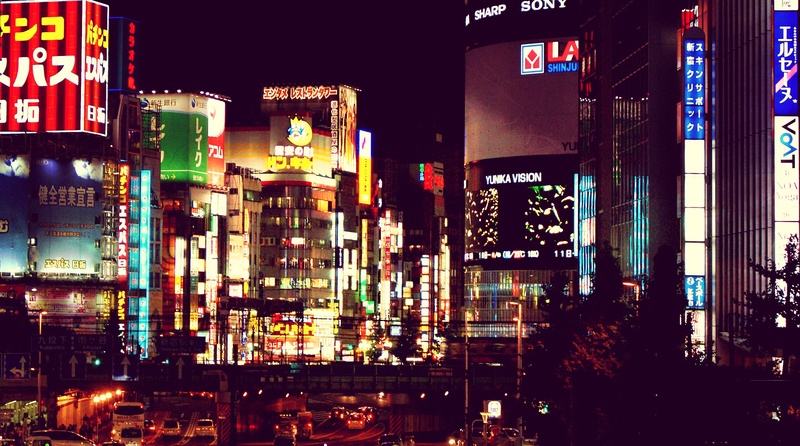 We had decided to stay in an area called Kabukicho, nicknamed as Sleepless Town it is Tokyo’s red light district. Why? Well I had this nagging perception that with Tokyo you have to be careful where you base yourself, I imagined some areas like Asakusa and Ikebukuro to be a bit deserted at night and as I thrive on chaos and noise it could only be Kabukicho for me. The taxi driver drove us along Yasukuni Dori, a long famous boulevard surrounded by a sea of flashing neon. As I stared out onto the deserted soaked streets I tried to remember what I knew about Japan and realised it was very little. I had tried to read about Japanese history, religion and culture but it just didn’t click with me, there was ofcourse geisha, sumo and Monkey Magic a seventies t.v. show I used to love. I sat through Japanese cinema and most times turned the movie off half way through bored to tears, all except one movie called Tokyo Story by Yasujiro Ozu. What a contrast with my trip to Iran and my obsessions with Iranian New Wave Cinema and everything else that comes with Persian culture. I had wanted to fly to Osaka and stay in Kyoto, Japan’s historical city but it was my boyfriend who decided we must stay in fashionable Tokyo. I was not expecting much as this city had been practically reduced to rubble with the Great Kanto Earthquake in 1923 and then again with the fire bombings in the war. I imagined Tokyo as a larger version of Hamburg and Rotterdam, only clad in neon, exciting yes but sadly lacking in historical sights. Our first evening was uneventful apart from a pair of my shoes falling apart while walking through the ankle deep flooded streets, it was too soon after the scorching sand dunes of Oman for them to survive. While we were fighting against the elements I nudged my boyfriend and told him to look at a woman infront of us who was dressed in high heels, a mini skirt and knee length stockings….she was basically naked and we were in the middle of a typhoon! We popped into a smoke filled cafe and sat there, a teenager of about 13 years old was bent over unconscious on a chair, other people looked about expressionless avoiding eye contact or staring into smartphones. Why would someone just fall asleep in here, where are his parents? Maybe there were travel delays due to the typhoon that we didn’t know about. So that was that, our journey to Japan…oh and I forgot to mention the terrifying sirens at 10am the next morning when we took a direct hit from Typhoon Phanfone, the sirens were scary enough but it was the shouting through a loud speaker that made it all so freaky. I recorded this from our hotel room, the shouting on loud speakers freaked me out! Half an hour after Phanfone hit blue skies appeared and it was the end of our depressing Japan, from now on it would be incredible! This entry was posted in Japan and tagged cabin crew, Emirates, Ginza, Hindu kush, Japan, Kabukicho, Narita, Narita airport, Narita express, Narita Express Train, Phanfone, Shinjuku, Tokyo, Typhoon, Typhoon Phanfone. Bookmark the permalink.